A dietitian shares some of her favorite places for a light lunch. 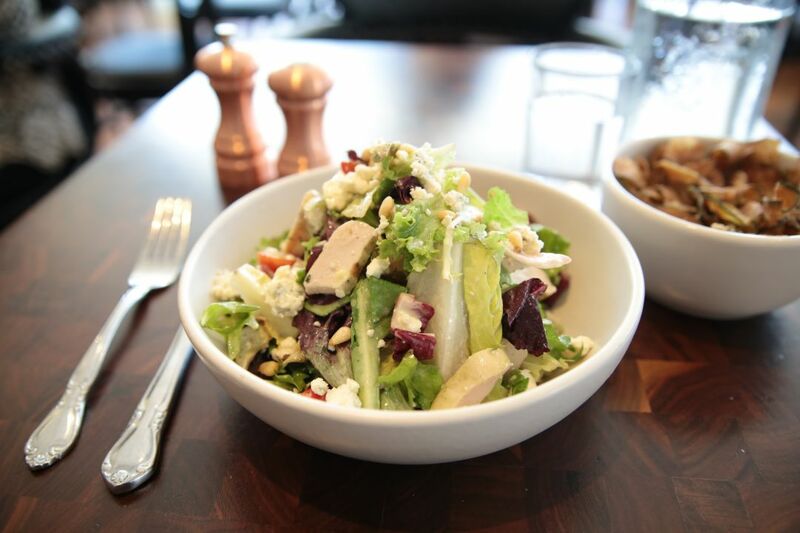 Chicken Harvest Salad at Adair Kitchen, with bison subbed in for poultry. 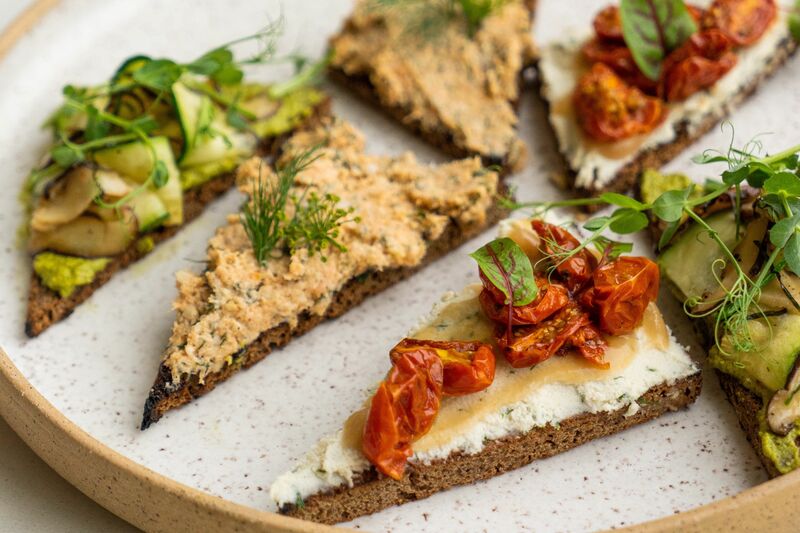 Healthy eateries are popping up all over Houston but in the fog of lunchtime hunger, finding a place to stop in for a quick and healthy bite can be a challenge. Salads have a reputation for being a diet food and while their purpose is to fill you up with a plate of vegetables and nutrients, in recent years they have turned into quite the calorie bomb thanks to fatty dressings, lots of cheese and other over-the-top fixings. 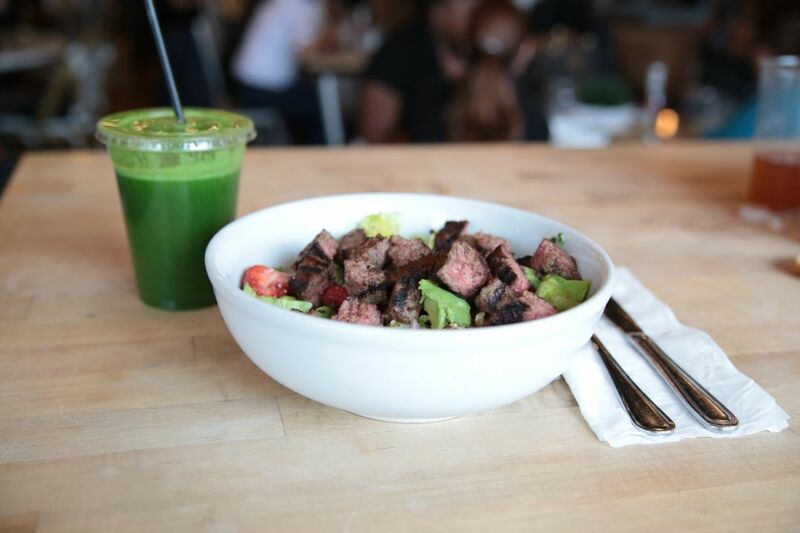 Starting today, we'll help decode the ever-changing Houston salad scene in a quest for this dietitian's favorite places to stop and refuel. Adair Kitchen on San Felipe is one of my go-tos to step in for a quick bite, a casual lunch meeting or just a healthy juice. I order the same salad every time I go there and I find myself craving it often. I even went there after my bachelorette party to recover the next morning. The chicken harvest salad is my standard order. The salad is filled with butter lettuce, raw walnuts, purple onions, avocado, strawberries, goat cheese and a homemade vinaigrette that ties all of the flavors together. 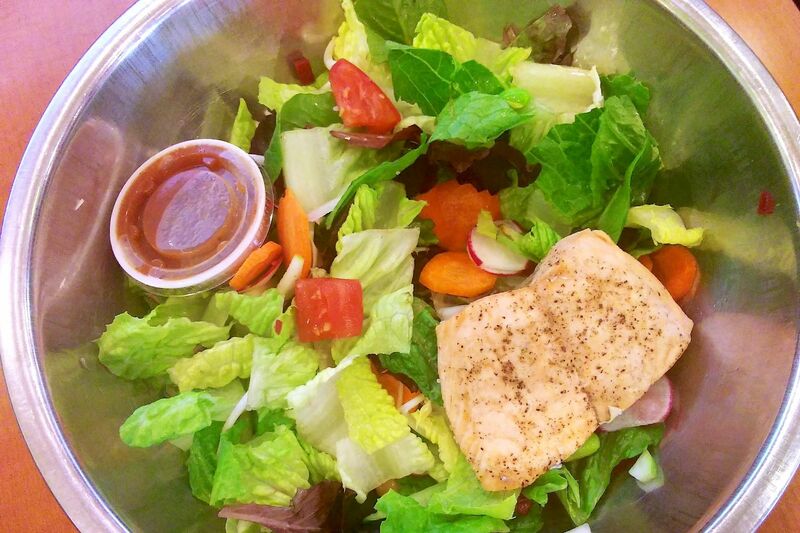 Healthy foodie tip: Always ask for no bread (it comes with the salad), no cheese and the dressing on the side. While cheese isn’t going to derail you completely from your healthy lifestyle, on average, one ounce of cheese can contain 100 calories. Therefore, if you are trying to cut back on unnecessary calories, that should be the first thing to go. Also, ask for dressing on the side— that way you can regulate how much dressing you are eating instead of running the risk of overdoing it. One of the main reasons I included Adair Kitchen on this list is because they will give you a bison patty instead of grilled chicken and we all know grilled chicken can get old after a while. I ask them to swap out my chicken with a bison patty and that takes my meal to the next level. Bison is a lean protein and is nutrient-comparable to chicken; for three ounces you get 152 calories, 22 grams of protein and seven grams of fat. Chicken provides you with 137 calories, 15 grams of protein and eight grams of fat on average. 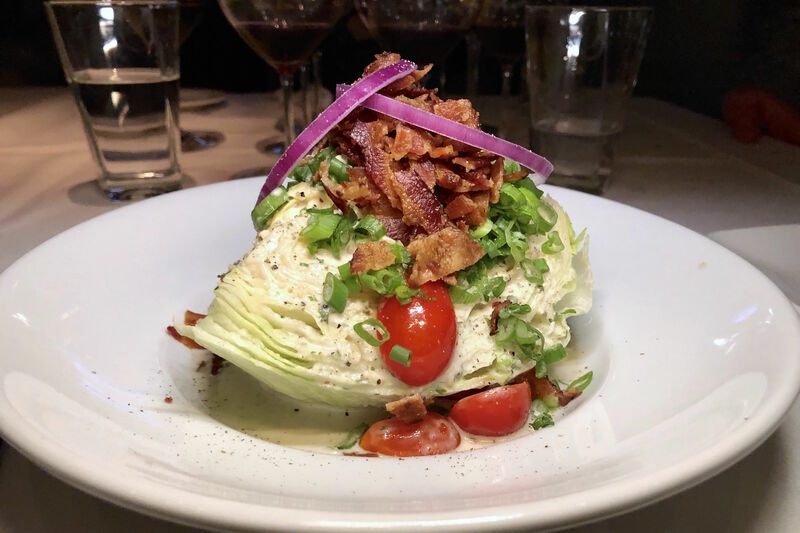 If you don’t like any of the salad options on the menu, you can always build your own, which is a great option for a picky eater. Island Salad with grilled chicken at Island Grill. Another excellent pick is small, local chain Island Grill, which has locations in and outside the loop. The family-owned spot is a staple in my diet because my husband can enjoy some of their less healthy options, while I reap the benefits of their Mediterranean diet-friendly fare. The restaurant's ingredients are always fresh and I have yet to be disappointed in my order. Island Grill has a smoothie and juice bar for the lightest of meals, but my favorite menu item is the Island Salad with grilled chicken. As at Adair Kitchen, I ask for the feta cheese and dressing on the side. 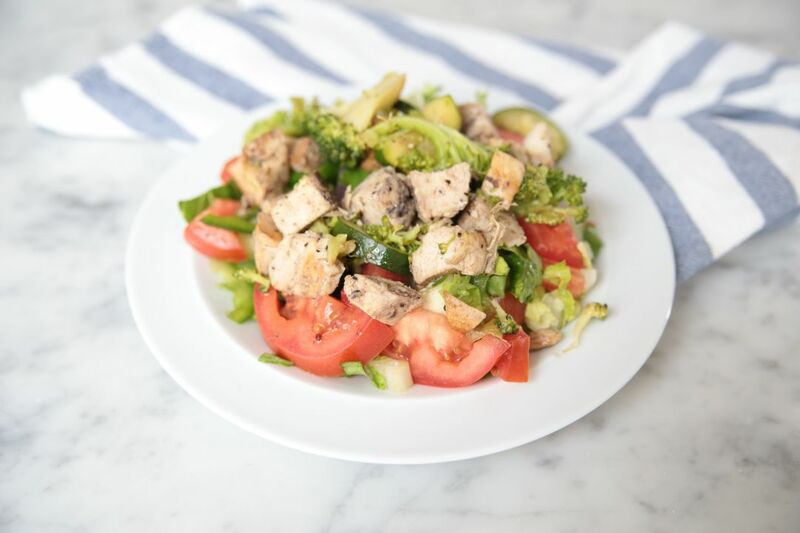 Healthy foodie tip: Your salads should always include three to four ounces of a lean protein; this is what will fill you up and keep you full. The Island Salad contains fresh lettuce, mushrooms, onions, tomatoes, cucumbers, broccoli and bell peppers. You won’t leave hungry and the big flavors of the salad will make you forget you are doing something good for your body. The atmosphere is always buzzing with families and working people from the area—I like to get there between 11:45 a.m. and noon in order to beat the lunch rush. Zucca chips at North Italia. The last stop today is North Italia on Post Oak. 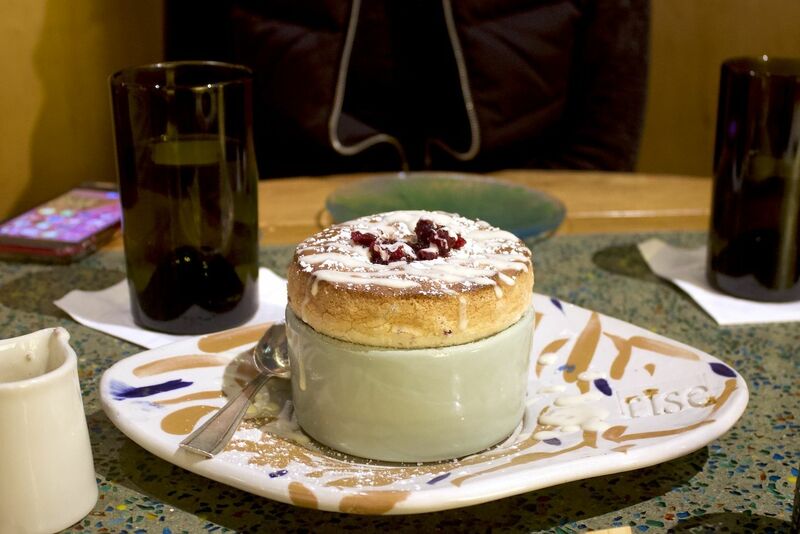 Yes, it's is a trendy lunch spot, but that's with good reason: The food doesn’t disappoint and the atmosphere is lively. I love the café décor, complete with large windows that allow a flood of light to enter the room. North is buzzing with the working crowd during lunch and they are good about getting you in and fed in a timely manner. They do take reservations, so I recommend placing one before leaving for the restaurant. 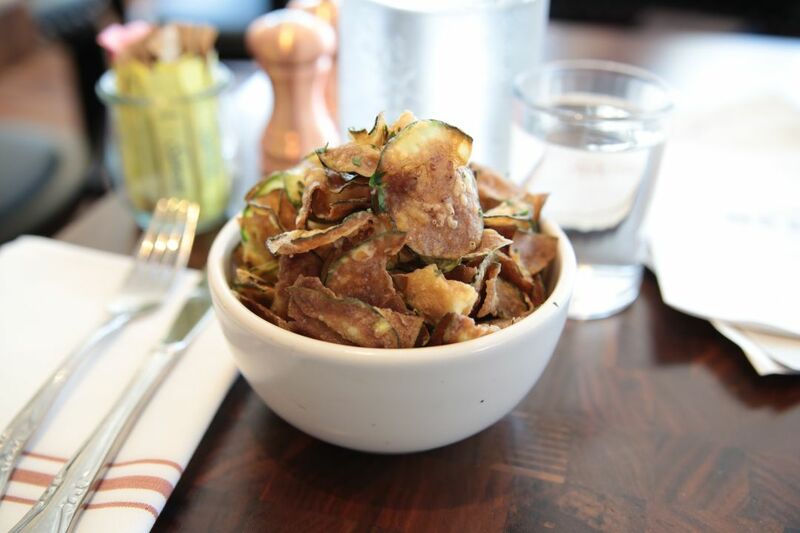 I love to start with their zucca chips, which are thin slices of zucchini baked to a crisp, chip-like texture. Seriously, everyone should start their meal with these. My favorite salad at North is the chopped chicken, which contains farm greens, tomatoes, toasted pine nuts and a Gorgonzola vinaigrette. Once again, the dressing and cheese are best ordered on the side. They also offer seasonal vegetable salads that are consistently loaded with nutrients, and a protein can easily be added. Healthy foodie tip: Avoid heavy dressings. Even though I love the Gorgonzola dressing pictured above, I would recommend swapping this out in favor of a basic balsamic vinaigrette to get rid of the added cheese, or use the dressing-on-the-side method. There are tons of more salads to share from all over the city, so look out for our next installment soon.